Tutorial | ShutterTux - Photography, Linux & Life! Shot Breakdown : Water Refresh! I love high speed photography & water splashes fascinate me. A few days ago, I decided to get myself splashed with cold water in this hot summer. The results were amazing! As you can see from the diagram, I took this photograph in a confined space, in my bathroom. I rested the camera on tripod which was just an arm’s length away. A couple of feet to my left was my speedlight with a gobo aimed directly at me without any modifier. The gobo made sure the background was sufficiently dark. The reflector you see in the diagram was the white wall of the bathroom. Camera Setting : Aperture – f/6.3, Shutter Speed – 1/200th, ISO 100, Focal Length – 28mm. For such a photograph in confined space, I was more careful of not wetting my camera and flash. Here, the timing was the key. I had the camera on 10 seconds self-timer & I had to make a splash on my face just at the same time. Its convenient if you have someone to throw water over you. However, after some 10 splashes, I eventually found out the above photograph to be perfect. The formation of water is perfect & so are my expressions. A splash like this hits you hard & as the water enters your nostrils to irritate, getting the right expressions is challenging. After the RAW processing, I cloned out the tiles pattern in GIMP to get a clear non-obtrusive background. I bumped up the contrast & even applied an unsharp mask. Next, I applied some vignette. Finally, I converted this to Black & White as I wanted it to be. That’s it & I had my photograph! Food photography is becoming very popular thanks to mobile phones. Even the rise in keeping fit has pushed people to shoot food & showcase it online. Today I’ll show you how I shot, bhuna bhutta(Roasted Corn). Roasted Corn is a must have during monsoons. It can be had at roadside in India. Its healthy as well as tasty at the same time. The masala & lemon squeezed make it absolutely mouth-watering. Shot Breakdown : Food is Ready! Ever since I undertook the 365 Project, shooting unique shots everyday has become an impulse. I don’t spend hours into thinking the shot to be made each day, but it comes to me naturally(touch wood). If you’ve been following my project, you would be knowing about the shot titled “Food is Ready”. Today, I’ll show you exactly how it was achieved. Looking at the shot, you might be fooled into believing its a two light setup but its not. The shot was done using a single speedlite. I used a Vivitar 285HV manual flash. For the shot setup, its nothing but my kitchen platform on which my stove rests. I cleared up utensils lying around the stove so I could setup my tripod & on it the wireless flash receiver(with flash off-course). The flash was covered by a newspaper so the light could not spill in background or cause a glare on the lens and illuminate the pressure cooker sharply from the left side. 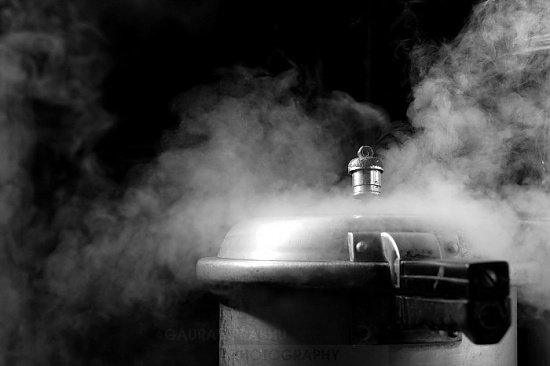 On the right side of the pressure cooker is a wall which acted as my reflector in this photograph. I sat around two feet away with my camera ready & with the composition I wanted. Just as the whistle of the pressure cooker blew, I took the shot. The first shot had less steam, so I took another a while later & that was the one you’re seeing here. As for post-processing, its minimal. Just RAW processing in Bibble Labs Pro followed by a greyscale conversion, contrast curve & a slight cropping in GIMP. My desired shot was ready. So before getting another flash, know how much one can do just with a single flash. This is just a simple example. Getting drenched in rain is one of the best things in life. The feeling is one which cannot be expressed in words nor pictures, one has to just feel it. Still I went ahead & decided to capture it into a photograph.